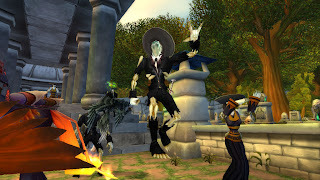 Every major city celebrates this lil holiday in Azeroth. I dropped by Stormwind today to pay my respects and get a quick achievement for fun. Interestingly enough, aside from the whole Forsaken skin there are a couple of small things to check out while visiting the City Graveyard. Jumpin for joy with that hottie Catrina!!! While tooling around in the Graveyard I noticed this interesting tomb. It shows the pic of a young warrior or paladin girl. No names present but it's the only one in the entire Graveyard. It would be interesting if there was a little lore behind the picture. 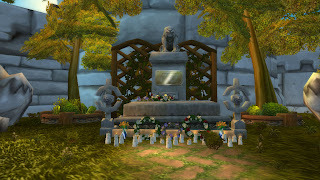 I recall back in the day that one of the Blizz guys passed on and they left a tomb just past Thorbardin's Wall in memoriam. Is this another possible remembrance or simply a fluke being the only one in the graveyard. Finally, before you head out for the day, drop by and pay respects to Tiffin, former Queen of Stormwind. Truly a fine memorial befit for royalty. Queen Tiffin's memorial, somber but beautiful as it should be.